Welcome to Social Feed Manager! Social Feed Manager (SFM) is an open-source tool designed for researchers, archivists, and curious individuals to collect social media data from Twitter, Tumblr, Flickr, or Sina Weibo. See the SFM Overview for a quick look at SFM. If you want to learn more about what SFM can do, read What is SFM used for? This guide is for users who have access to SFM and want to learn how to collect. If you’re an administrator setting up SFM for your institution, see admin-documentation. Sign up: On the SFM homepage, click “Sign up.” Fill out the form, including a unique email. Once you sign up, you will be automatically logged in. Get credentials: You’ll need to authorize access to the social media platforms using credentials. See Setting up Credentials. Create a collection set and within it a collection, where you’ll actually collect data. See Creating Collections. Add seeds: Seeds are the criteria used to collect data. You’ll add user accounts or search criteria. See Adding Seeds. Export your collections when you want to see and work with your data, or adjust settings. See Exporting your Data. You can always come back to this user guide for help by clicking Documentation at the bottom of any SFM page and selecting User Guide. Social Feed Manager (SFM) collects individual posts–tweets, photos, blogs–from social media sites. These posts are collected in their native, raw data format called JSON and can be exported in many formats, including spreadsheets. Users can then use this collected data for research, analysis or archiving. Collecting from individual accounts such as the tweets of every U.S. Senator (Twitter user timeline). Gathering Flickr images for analysis or archiving the photographs from accounts donated to your organization (Flickr user). Researching social media use by retrieving a sample of all tweets (Twitter sample), or by filtering by specific search terms (Twitter filter). Capturing a major event by collecting tweets in a specific geographic location or by following specific hashtags. Collecting Tumblr posts for preserving institutional blogs or the work of online artists. (Tumblr blog posts). Archiving posts from any social media platform for later research. Note that SFM currently collects social media data from Twitter, Tumblr, Flickr, and Sina Weibo. Twitter sample: Collects a Twitter-provided stream of a subset of all tweets in real time. Twitter filter: Collects tweets by user-provided criteria from a stream of tweets in real time. You could export it into a CSV or Excel format for a basic analysis (Exporting your Data), or load the format into analysis software such as Stata, SPSS, or Gephi. You could set up an archive using the JSON files or Excel files. Collecting and using data from social media platforms is subject to those platforms’ terms (Twitter, Flickr, Sina Weibo, Tumblr), as you agreed to them when you created your social media account. Social Feed Manager respects those platforms’ terms as an application (Twitter, Flickr, Sina Weibo, Tumblr). Social Feed Manager provides data to you for your research and academic use. Social media platforms’ terms of service generally do not allow republishing of full datasets, and you should refer to their terms to understand what you may share. Authors typically retain rights and ownership to their content. In addition to respecting the platforms’ terms, as a user of Social Feed Manager and data collected within it, it is your responsibility to consider the ethical aspects of collecting and using social media data. Your discipline or professional organization may offer guidance. In addition, take a look at these social media research ethical and privacy guidelines. Before you can start collecting, you need credentials for the social media platform that you want to use. Credentials are keys used by each platform to control the data they release to you. You are responsible for creating your own credentials so that you can control your own collection rate and make sure that you are following the policies of each platform. Collections are the basic SFM containers for social media data. Each collection either gathers posts from individual accounts or gathers posts based on search criteria. Collections are contained in collection sets. While collection sets sometimes only include one collection, sets can be used to organize all of the data from a single project or archive–for example, a collection set about a band might include a collection of the Twitter user timelines of each band member, a collection of the band’s Flickr, and a Twitter Filter collection of tweets that use the band’s hashtag. Before you begin collecting, you may want to consider these collection development guidelines. Because collections are housed in collection sets, you must make a collection set first. Navigate to the Collection Sets page from the top menu, then click the Add Collection Set button. Give the collection set a unique name and description. A collection set is like a folder for all collections in a project. If you are part of a group project, you can contact your SFM administrator and set up a new group which you can share each collection set with. (This can be changed or added later on). Once you are in a collection set, click the “Add Collection” dropdown menu and select the collection type you want to add. Enter a unique collection name and a short description. The description is a great location to describe how you chose what to put in your collection. Select which credential you want to use. If you need to set up new credentials, see Setting up Credentials. 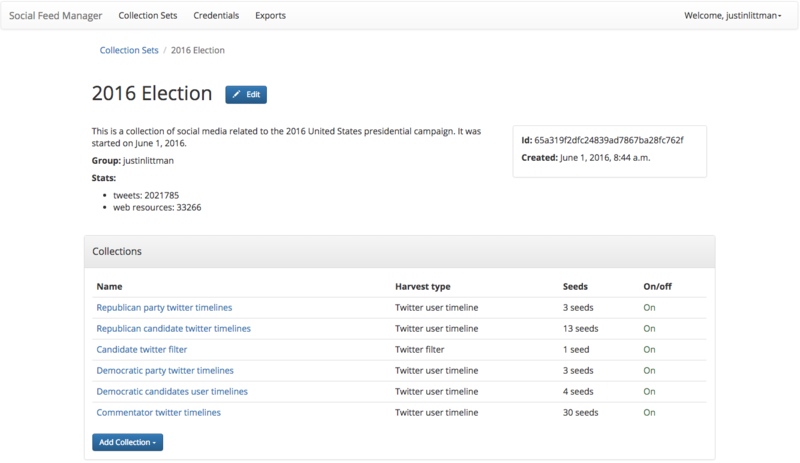 Seeds are the criteria used by SFM to collect social media posts. Seeds may be individual social media accounts or search terms used to filter posts. Click Add Seed for adding one seed or Add Bulk Seeds for multiple. Enter either the user ids or search criteria and save. When you have added all seeds you want, click Turn on. In order to access the data in a collection, you will need to export it. You are able to download your data in several formats, including Excel (.xlsx) and Comma Separated Values (.csv), which can be loaded into a spreadsheet or data analytic software. At the top of the individual collection, click Export. Select the file type you want (.csv is recommended; .xlsx types will also be easily accessible). Select the export file size you want, based on number of posts per file. You may want to select a number of posts that will work the program that you will be loading the data into, e.g., Excel. Select Deduplicate if you only want one instance of every post. This will clean up your data, but will make the export take longer. Item start date/end date allow you to limit the export based on the date each post was created. Note that the date you enter will be in the local timezone. The date in posts may be in a different timezone, e.g., UTC. Appropriate adjustments will be made to account for this. Harvest start date/end date allow you to limit the export based on the harvest dates. When you have the settings you want, click Export. You will be redirected to the export screen. When the export is complete, the files, along with a README file describing what was included in the export and the collection, will appear for you to click on and download. You will receive an email when your export completes. To help understand each metadata field in the export, see Data Dictionaries for CSV/Excel Exports.